And killed him in mid-kingdom with a kiss. "Memorial verses on the death of Théophile Gautier." 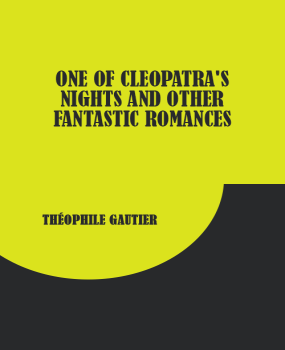 The stories composing this volume have been selected for translation from the two volumes of romances and tales by Théophile Gautier respectively entitled Nouvelles and Romans et Contes. They afford in the original many excellent examples of that peculiar beauty of fancy and power of painting with words which made Gautier the most brilliant literary artist of his time. No doubt their warmth of coloring has been impoverished and their fantastic enchantment weakened by the process of transformation into a less voluptuous tongue; yet enough of the original charm remains, we trust, to convey a just idea of the French author's rich imaginative power and ornate luxuriance of style. The verses of Swinburne referring to the witchery of the novelette which opens the volume, and to the peculiarly sweet and strange romance which follows, sufficiently indicate the extraordinary art of these tales. At least three of the stories we have attempted to translate rank among the most remarkable literary productions of the century. These little romances are characterized, however, by merits other than those of mere literary workmanship; they are further remarkable for a wealth of erudition—picturesque learning, we might say—which often lends them an actual archæologic value, like the paintings of some scholarly artist, some Alma Tadema, who with fair magic of color-blending evokes for us eidolons of ages vanished and civilizations passed away. Thus one finds in the delightful fantasy of Arria Marcella not only a dream of "Pompeiian Days," pictured with an idealistic brilliancy beyond the art of Coomans, but a rich knowledge, likewise, of all that fascinating lore gleaned by antiquarian research amid the ashes of the sepultured city—a knowledge enriched in no small degree by local study, and presented with a descriptive power finely strengthened by personal observation. It is something more than the charming imagination of a poetic dreamer which paints for us the blue sea "unrolling its long volutes of foam" upon a beach as black and smooth as sifted charcoal; the fissured summit of Vesuvius, out-pouring white threads of smoke from its crannies "as from the orifices of a perfuming pan;" and the far-purple hills "with outlines voluptuously undulating, like the hips of a woman." And throughout these romances one finds the same evidences of archæologic study, of artistic observation, of imagination fostered by picturesque fact. The glory of the Greek kings of Lydia glows goldenly again in the pages of Le Roi Candaule; the massive gloom and melancholy weirdness of ancient Egypt is reflected as in a necromancer's mirror throughout Une Nuit de Cléopâtre. It is in the Egyptian fantasies, perhaps, that the author's peculiar descriptive skill appears to most advantage; the still fresh hues of the hierophantic paintings, the pictured sarcophagi, and the mummy-gilding seem to meet the reader's eye with the gratification of their bright contrasts; a faint perfume of unknown balm seems to hover over the open pages; and mysterious sphinxes appear to look on "with that undefinable rose-granite smile that mocks our modern wisdom."